With the 4th of July right around the corner, I thought I'd share with you one of my favorite patriotic-colored polishes. 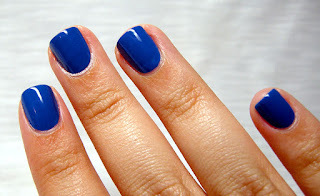 And since I already shared one of my favorite reds (OPI- Thrill of Brazil) here comes one of my favorite blues! 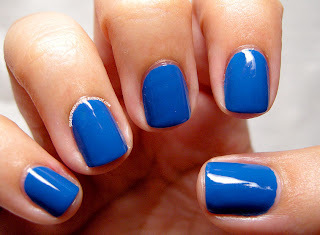 Essie- Mesmerize is a beautiful deep, yet somehow bright blue creme released in Essie's 2009 Spring Collection. I've seen some describe it as a Royal or Cobalt Blue. And I definitely agree! Wear on this polish was fantastic! No tip wear for at least 3 days and I didn't have any problems with chipping. I know 3 days doesn't sound that long, but just to set things straight, I'm not one to leave polishes on for more than 2-3 days. So it's good for me. 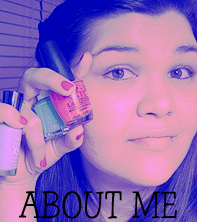 As expected with super pigmented and dark polishes, I did have minor staining. But that's nothing a little buffing or a better base coat couldn't fix! Essie Mesmerize is still available for purchase as it is part of the Essie Permanent Collection. I highly suggest it, especially for the 4th of July and winter nails. It is a staple and my collection wouldn't be complete without it. Thank you for reading an I hope you enjoy!